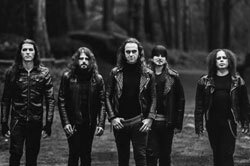 Portuguese pioneers Moonspell first brought the dark flames to their native country – and then set the rest of the world aflame with milestones such as Irreligious or Night Eternal. Indeed eleventh studio album Extinct erects another monument to sundowns and those dark hours and lets Fernando Ribeiro`s sombre vocals collide with modern riffing, blackened melodies and operatic grandeur. Always one step ahead of the rest, always resisting all genre boundaries!